I read this article and found it very interesting, thought it might be something for you. 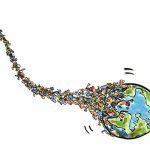 The article is called New Ecological Economics: Superorganism and Ultrasociality and is located at https://evonomics.com/ecological-economics-superorganism-lisi-krall/. Lisi Krall: Thank you Della. Della Duncan: Let’s start with just a brief introduction about yourself for our listeners. Lisi Krall: Ok. I am a right now a professor of economics at the State University of New York at Cortland. And I concentrate on, I guess you would call ecological economics. But I actually have a lot of disagreement with much of what goes on in ecological economics. Della Duncan: Yes I’ve seen you associated both with ecological economics and evolutionary economics. So what do those two areas of economics mean to you? And what are the disagreements that you have? Lisi Krall: The main disagreement that I’ve had with ecological economics is that I actually don’t think ecological economics in a lot of ways has a real good handle on the economic system. There are a lot of ecologists in ecological economics, and it’s always said that economists don’t understand ecology. But I also think that the problem is somewhat the opposite as well, and that is that the ecologists don’t understand enough about the economy to have a real solid understanding of the problematic economic structure we have on our hands. Della Duncan: And if you were to just briefly describe ecological economics, how you see it? What is ecological economics? Lisi Krall: Ecological economics basically derives from the basic idea that the Earth is a subsystem of the biosphere and therefore some attention has to be paid to how big this economic system can be. So that’s kind of the starting point. Ecological Economics has gone in two different directions — there are two branches. One is this eco sphere studies branch of ecological economics, and that branch is sort of associated with putting prices on things that aren’t priced in the economy. That’s entirely what it’s about. And it is hardly discernible from standard orthodox economics. It’s the study of externality, public goods, and that sort of thing. There’s really no difference. The other branch of ecological economics, which is the more revolutionary branch, is the branch that talks about the issue of scale. That branch has been very good in talking about the need to limit or end economic growth. But in the conversations about how we might do that — and in particular dealing directly with the problem of whether or not you can have a capitalist system that doesn’t grow — I think that’s where that branch of ecological economics has not been as clear as it needs to be. So this kind of helps us transition into something that you talk about: ultrasociality. Can you first explain ultrasociality as a concept within the more-than-human world, within animals or insects. What is it in the more ecological sense? First of all let me just say this that I don’t think that there is an agreement about the definition of ultrasociality, either on the part of evolutionary biologists, or on the part of anthropologists and economists like myself. So I think that it is word that’s used by different people to describe different things in the broader sense. I think it refers to complex societies that have highly articulated divisions of labor and develop into large scale — essentially city states, and practice agriculture. That’s the definition that’s used in our work, the work that I’ve done with John Gowdy. We have adopted that definition. And so ultrasociality I would say is a term that has meaning other than in human societies. To talk about those kinds of societies that occur mostly in other than humans: in ants and termites that practice agriculture. Della Duncan: Can you describe that? Describe, to an ant, what that is? What the concept is. Lisi Krall: I’ll take the example of the leaf cutter ant, the Atta ant. They develop into vast, vast colonies that have highly developed, profound divisions of labor. And the divisions of labor in Atta ants are so incredible that they actually change morphologically based on the job that they do. Della Duncan: Within their lifetime? Lisi Krall: Yes. Well, I think you get one ant that develops in a certain way it will stay that way, although there is flexibility in terms of tasks that they do as well. But they have this very highly articulated and cohesive division of labor, and what they do is cultivate fungi. They cut and harvest leaves and then they feed the leaves to their fungal gardens, and they themselves then feed on the fungal gardens. And so I call these kinds of things self-referential, they are very expansive. E.O. Wilson refers to the advance of social insects like that as the “the social conquest of the earth.” They are extraordinarily successful and they are what I would consider ultrasocial. Della Duncan: What do you mean by self-referential? Lisi Krall: By self-referential I mean that it sort of refers to itself. So you have a very highly differentiated ant colony that will cut leaves and process those leaves and continue to expand as long as they’re not invaded by some kind of bacteria or toxin that ruins the fungal gardens and creates problems for them. And as long as they have the leaves to cut they are extraordinarily expansive. They’re sort of a system unto themselves, that in a sense their dynamic is cordoned off in a way from the exterior world. They kind of refer to themselves. The only reason that I started looking at ants is because a number of years ago John Gowdy came to me and he had become aware of these superorganism ant colonies that practiced agriculture. And so he came to me it was about, I don’t know, four or five years ago? And said to me, “Do you think that it’s possible that the evolutionary dynamic of these species of insect has any similarity to humans when humans made the transition to agriculture” Because one thing we know is that the population dynamic for humans changed dramatically. There are many other things that changed dramatically too but the population dynamic changed dramatically when humans made that transition to agriculture. So I guess I was crazy enough to say, “Well yeah that’s possible. Why don’t we look at it?” And so that led us down this the path of this present project. Della Duncan: So let’s go into that then. So eight thousand years ago, about the time of the agricultural revolution, what is it that happened from your perspective? For humans — what’s the story that you see now with your research? Lisi Krall: Well eight to ten thousand years ago humans began the practice of agriculture. And over the ensuing five thousand years after that, what happened to their societies was profound. They went from relatively small bands that lived in mostly equal societies, basically geared toward fitting in with the rhythm and dynamic of the non-human or other-than -human world that surrounds them. That’s not to say that there was no manipulation of the non-human world, but it was modest. Human beings lived as hunters and gatherers — and I think this is something that people don’t think about — not for 5000 years or 10,000 years, or 15,000 years, but literally as anatomically modern humans for something like 150,000 years a long, long, long time. So we became human in that kind of environment. With agriculture you have a human ability to engage agriculture because humans have a capacity for dividing up tasks, communication, and that sort of thing that lends itself to engaging an agricultural economy. And so John and I talked about the division of labor as one of the economic drivers of ultrasociality. And I would say without the capacity to do that, and not every species has that capacity — ants and termites do — But not every species does, without that capacity I think agriculture could not have been engaged and it certainly could not have been engaged to the point where you get, within 5000 years, the development of these vast, highly complex — anthropologists call them state societies. And then we get into this growing of annual grains and mining all of that Pleistocene carbon in the soil. There was a stock of carbon in the soil that we were able to mine and that boosts things, and the division of labor starts, the production of surplus, and the expansion of the division of labor. Hierarchies begin to develop and we’re engaged in a vast, self-referential expansionary system. And then you get the development of markets — and markets have their own institutional, evolutionary dynamic where you go from markets as a place of exchange of surplus to a market economy where the whole purpose of the economy is the production of surplus value, profit, reinvestment, and expansion. Della Duncan: So let’s unpick the term ultrasociality because it has to do with what you’re talking about. So it doesn’t mean extroversion — that we’re hyper social — or that we’re really outgoing or anything I think people could think that hearing the phrase ultrasociality. It doesn’t mean that you can’t be lonely or isolated within an ultrasocial environment. So can you unpick what ultrasociality means?. Lisi Krall: Ultrasociality is different than sociality. It has to do with these rather mechanistically articulated kinds of economic systems that take hold, where the individual becomes more of a cog in the machine of producing those annual grains and keeping the society going in that respect. So people are more alienated. They have less personal autonomy. In humans, these societies became extraordinarily hierarchical. I like to think about the fact that within five thousand years, after the onset of agriculture you get the development of these large-scale state societies. Where probably the majority of people lived in some realm of servitude. That’s not a liberating thing. And they are extraordinarily expansive and they are disengaged from the rhythm and dynamic, in some sense, of the other-than-human world. So they’re ecologically destructive. If you look at the global market economy right now, it’s a very expansionary, highly articulated economic system. We would call it a superorganism. And systems like that are extremely difficult to disengage. And one of the reasons that we started looking at agriculture and started looking at this ultrasocial transition, is because we recognized that the altered dynamic that had taken hold with agriculture is still with us. I think about it in this way: when we engaged agriculture the trajectory of our social and economic evolution was altered profoundly. We think it was a major evolutionary transition for humans. So what does that do to the human being? First of all, individual humans become less important and it sets humans up in this vast, self-referential economic system that’s no longer engaged in the rhythm and dynamic of the non-human world. It sets humans up to have this kind of oppositional relationship with the non-human world. Della Duncan: Not just oppositional but dominant over. Lisi Krall: Right. We manipulate and control it and dominate it. And it is other than us. Not part of what we are, but other than us. And capitalism is really this kind of self-referential system with this imperative of growth and this internal kind of connectivity that is hell bent on domesticating every last smidgen of the wild earth before it’s done. So we’re involved in a system like that, that is going to leave us alone with ourselves. If you look at our evolutionary history you find that we evolved as human beings in a world where we were basically embedded in this vital, other-than-human world. And we came to know ourselves — what we were individually and how we fit in — through interaction with that varied, robust, non-human world. We as humans have a very long period of maturation. It takes us 20 years to reach maturity. That long stretch of maturation was timed and punctuated with deference to the non-human world. So that we became healthy human beings psychologically through this constant play between us and the non-human world. We came to know ourselves individually, to be able to see ourselves in the complexity of the world. Not to have to dominate, but to be one of many. And so the tragedy for us is that we have this very complicated evolutionary history where on the one hand we do best embedded in a robust other-than-human world. We do best, we’re healthiest in that kind of world. And yet we have this strange part of our social evolution now that has taken us on tract which is going to destroy every bit of the non-human world before we’re done. And so when I look at our present ecological crisis that’s how I see it. It’s a crisis of our own evolution. Lisi Krall: I think human nature is really complicated matter. What is human nature and what isn’t human nature? Let me see if I can touch on kind of a number of things. I think our crisis is not a problem of human nature in the way that that you alluded to in that people often talk about how we’re inherently greedy, exploitative kinds of beings. And that this is the problem. I don’t think that’s true. I think the more serious problem is that we engaged a kind of social evolution, that started with agriculture, that put us on a path of expansion and interconnectedness and ultimately, in humans, hierarchy, and all that kind of stuff. That is a really difficult path to disengage now. Agriculture couldn’t have been engaged if humans didn’t have some kind of inherent capacity for task allocation, sociality. So there is an element of social evolution. What traits we have that allow for that kind of system to get going. But engaging that kind of system itself is a different evolutionary proposition. It has to do with the evolution of groups and cooperation. And so when we engaged agriculture we took off on this altered kind of trajectory. It’s not human nature in the sense that it’s about the evolution of a group and the force of group selection in human evolution, in a sense. But, I mean, that is a natural process that takes place. And so I suppose I sort of shy away from talking about human nature. It’s part of an evolutionary process, but we have a complicated evolutionary history, and evolution doesn’t just play out at the at the level of the individual. It also plays out at the level of the group. And so I would say that. Okay, so now on to Adam Smith and “capitalism as natural”. That too is a complicated proposition. Adam Smith thought that the market economy was the natural order of society because it takes our innate human tendencies and puts them together in an organized way, where people can be selfish because we have an innate tendency for selfishness, and that that selfishness is channeled into a socially optimal outcome. Adam Smith thought human beings have a natural propensity to truck, barter, and exchange. He thought there was a natural human tendency to markets. So what do you get with capitalism? You get the development of markets. You get that development of exchange. People can pursue their self-interest and at the end of the day what do you get? Everybody gets what they want in the amounts that they want for the lowest possible price — if you have competition. Right. He thought it was natural order. Is it a natural order? I do think there’s something in our evolutionary history that puts us on a path of having these kinds of finely articulated, expansionary systems that started with agriculture. And they can take a variety of forms depending on the institutional clothing that humans give them. There is kind of a natural tendency in that respect. Now having said that, people need to understand that evolution is not necessarily about perfection. It can’t see ahead. And it is quite possible that we’ve been placed on an evolutionary dead end. So I don’t look at the process of evolution as something that is constantly creating ever more perfect outcomes. Evolution responds to the immediate circumstances. Things get selected or not based on whether they’re good at that moment. There’s no question that agricultural societies had a selective advantage. Ten thousand years later, can we honestly say that global capitalism and expansionary, highly interconnected systems are a good thing? No. But that’s where we’ve ended up. Della Duncan: It really brings up for me the Native American concept of the Seventh Generation thinking. You know, what if all decisions and ideas that we made had this kind of real, futuristic thinking of how this would affect seven generations for now. So I wonder about that. And I also think about our being able to have a conversation about our own evolution. I’m imagining, is the difference between us and termites, or ants, the way that we have an ability to change it? I’m wondering if our awareness of this and the fact that we were organized in a different way, than maybe we have the potential to organize yet again in a different way? Can our awareness be that opportunity for change? Lisi Krall: Well, you asked the ten thousand dollar question, and that is whether we have the capacity to reflect, and through that reflection to alter the path that we’re on. I don’t know the answer to that question. We also have things that ants and termites don’t have. We have institutional fabric, private property laws, the development of markets, methods of redistribution of income, and I could go on and on about the institutional fabric that humans have. We also have the capacity for technological change, and the creation of institutions and technological change makes us very different than ants and termites. It actually creates a situation where things might be even more problematic for us because of these institutions. We have this infinite variety of cultures that we can adopt. But once you adopt one it has a lot of staying power. So it’s actually hard to change institutions. And technological change, and the structure of technology at a given moment in time, is very difficult to alter. Look at the challenge of trying to change our energy economy. We have this entrenched kind of fossil fuel structure — very difficult to change. Not impossible, but it is difficult. So do we have the capacity? Well, we have all kinds of localized movements — movements of localization. And an extensive conversation about sustainability. We certainly have an ability to reflect and understand that this is not sustainable, that this path we’re on is not sustainable. But I think it is extremely difficult to dismantle a complex system like we have, because when you start pulling the threads you don’t know where you’re going to end up. And each and every one of us is articulated in some way with this system. So I think, yes, through reflection we can try to create different institutions, try to create change, and try to create different incentives and a different kind of system. Whether that will be sufficient to assuage the sixth great mass extinction, I don’t know. I don’t know the answer to that question. And I don’t think anybody does. I always feel bad because I think, well, that doesn’t sound very hopeful. But I think that it’s important for us to understand the problematic economic structure that we have on our hands, and how difficult it is to undo that. And I don’t think people think about that enough. Della Duncan: So what has been the response that you’ve gotten as you’ve uncovered this and as you’ve shared some of this thinking? Lisi Krall: I think generally people want a message of hope, and I don’t necessarily think that the work that I’ve done offers a message of hope. What it offers is some serious thinking about the nature of economic structure and the complexity of it. When people ask me what my research is, I say, “well, I’ve come to the conclusion that humans evolved like ants and we’re screwed.” [Laughs] I get deer in the headlights eyes. Like, “What! ?” Or even just the proposition that we have a lot to learn about our social evolution by looking at social insects. People don’t believe that’s true. If you want to talk about our sociality and talk about primates, people are open to talking about that. They see that connection. And yet I think that there’s as much to learn by looking at the evolution of social insects for human beings as there is by looking at primates, in terms of our sociality. I think that’s hard for people to embrace. Because you look at an ant and they’re so different than we are, for one thing. And then you look at those superorganism colonies, and for most people they find them kind of creepy. And so we look at those and we say to ourselves, “We’re nothing like that.” And yet I think it’s actually a case of convergent evolution that’s going on. 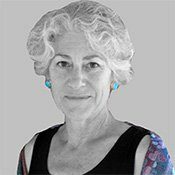 Della Duncan: So as we get into this more involved conversation of evolution, I know that you’ve described yourself as a closet evolutionary biologist, and I know this is partially because this idea of evolutionary biology, often referred to as sociobiology, can have some problems or challenges. It can connect with issues of biological determinism. Can you discuss this a bit and maybe just define the field of sociobiology? Lisi Krall: Well, I think it means in a simple way that there’s a biological basis for social behavior. But sociobiology developed into things like social Darwinism — sort of survival of the fittest where you could justify the power of the robber barons because they were somehow better adapted and they won that competitive battle. I mean, I have problem with that kind of sociobiology. Also as a social scientist you don’t want to say behavior is genetically encoded. You can have all kinds of problematic plays on that right. Because then you can start to say, “Well, women are going to behave in certain ways because this is how they’re built. Men are going to behave in other ways.” We don’t like social scientists to do that — to think in those terms. But I guess for me I started to confront questions which didn’t have any easy answers. And I found I think the kinds of questions we are confronting right now, like the question of how we reckon this vast global economic system with a limited planet. How did we come to this? I don’t think those kinds of questions can be answered well unless you’re willing to go into interdisciplinary work. So interdisciplinary work provides the most fertile ground for trying to think about what happened to us, what the possibilities are for change, and how we might change. You know, for example, we have conversations about the energy transition and making the transition to renewable energy. I’m all for transitioning to renewable energy. Don’t get me wrong. But conversations about transitioning to renewable energy without conversations about employment, without conversations about what kind of world we want, what should the relationship with humans be with the non-human world, how much of this planet do we want to domesticate, what are the advantages to downsizing. Those are conversations that we never have when we talk about this transition to renewable energy. And in some sense the transition to renewable energy in that way is no more enlightened than talking about clean coal, because it’s a technological solution to what is actually a profound social and evolutionary problem. Della Duncan: Particularly if we maintain the same level of consumption and try to have the same level of growth. Della Duncan: So you’re questioning the goals of the system and what it means to live a meaningful life. Lisi Krall: What it means to live a meaningful life and how do human beings — and I’ll use Wes Jackson’s words here — once again become a “species in context.” Because Wes says that with agriculture we became a species out of context. And he’s right. Our job here is not simply to map out a road to some kind of vague sustainability with renewable energy. That’s not what we want to do. It’s not going to be enough either. It’s not going to be enough and it’s not where we want to end up. Della Duncan: It’s not fulfilling. Lisi Krall: It’s not fulfilling. And, you know, at some level — and I know this sounds simplistic — but I look at the non-human world and I see such magic. I think about the sources of human imagination. That’s where they mostly come from. And that’s not a deep ecology perspective. I mean that’s a human centered perspective. Why in the world would we want to end up without that? I don’t think it’ll be the end of the world. Whatever happens to us. But it could be really tragic. Della Duncan: It will bring about a lot of human and more-than human suffering. Della Duncan: Yes. And a much less interesting world. And why would we want to do that? And yet how do we dismantle the structure and dynamic of this system? And so I want to see the conversations about ending growth ferreted out more carefully. Everybody knows we need it. That’s nothing new. The question is how we do that. And that goes back to your question: do we have that capacity? Do we have the capacity to change? And I think that’s the ten thousand dollar question. I don’t know the answer to that question. I think we should take seriously the power and evolutionary significance of a vast system like we have. It’s no small matter to change that dynamic at this point. Della Duncan: And maybe it’s already changing as well? Maybe if we start to look for it and we start to bring out the stories or the examples where it is changing, it will kind of grow? And you mentioned localization — and so there’s localization. There’s also de-growth or steady state economy movements. And then also the change from GDP to Gross National Happiness — those types of movements. It’s almost like we haven’t found a new system, like the next system, or a new economic system, but that at some there’s multiple places of intervention that are being tried around the world. Different points, different attempts. It’s almost like a holistic approach. Lisi Krall: I think that’s true. And I also think that the system itself has many contradictions and those contradictions lead to significant problems from time to time. So I think right now about kind of the movement of technology, the financialization of the economic system. The increased inequality. That creates some significant contradictions in the system because that’s not sustainable for the way this system has to work. You have to have people spending money on the things that are produced. If you’re producing things without people — and people are making a lot of profits on them — and you don’t have people with enough money to buy what’s produced you…I mean it’s a simple kind of circular flow problem. You’ll have a crisis. You’re going to have a crisis. And so I think that the system itself is unstable. It expands and it contracts. And now we’re in this period of what seems to be secular stagnation. Employment is a greater challenge in a period of secular stagnation. So we have that kind of ongoing problem and contradiction. And I do not believe that lowering taxes on corporations and the rich is going to resolve that problem. Della Duncan: One thing that I like to do is try to connect the conversations with ways that individuals who are listening can really think about in their own lives, or change their own behavior potentially — just invitations for people. Based on what you’re saying, I’m really seeing an appreciation for foraging and relearning skills from the wild, like bushcraft and foraging. That kind of connection to nature that’s not just a garden or that’s not agriculture. That learning about place, and learning about natural seasons and things like that, and medicine, and all that kind of stuff. So Foraging and connection to nature. Another thing is I really do think that there is something with this idea of changing from growth to well-being, and looking at how can we change the goals of our economic systems from growth to well-being. Or to really explore steady state economics or degrowth, and understand that growth without regard to our planetary boundaries is a problem. People you’ve talked to have a hard time seeing themselves — seeing the relation between themselves and an ant. And being that cog in the machine, which I can imagine doesn’t feel good to me — to acknowledge the similarity. So what about an invitation to see one’s work as more of right livelihood, or to see one’s work as more purpose-driven, or to challenge ourselves to think about how can we live more in line with our integrity or our greater purpose. To just start to break out of that mentality of, “I’m just a cog in the machine,” and actually to look at our agency, our capabilities, what we see as our passion or purpose? And then the final invitation to people is around this idea that it’s not that we have cooperation as an innate capability or not. It’s what we use our cooperation for. What are we cooperating to create. And so to really invite people to cooperate to build on those qualities, to leave our children or future generations with the qualities of altruism, of giving, of cooperation — for these kinds of goals of well-being, of connection to nature, of harmony, of connection to the more-than-human, other-than-human world. Really seeing what it is that we leave beyond. And also what are we cooperating for, what are the goals that we’re working towards, the vision that we see. For me, hearing what you’re saying, maybe these can be invitations for people to explore in their own lives. What do you think? Is there anything that you would?